There are 20 posts in this thread, and it has been viewed 15602 times. How would you rate Street Hoops? Sorry about the delays... But Game of the Week is back! 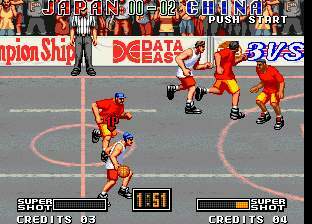 Street Hoop is one of the few sports games on the Neo Geo. It also seems to be inspired by NBA Jam.. Unfortunately, I've never tried it, so I don't have much to say. 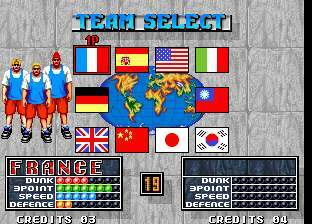 Street Hoop, known in Japan as Dunk Dream and known in North America as Street Slam, is a basketball game developed by Data East for Neo-Geo, released in 1994. Every team in both versions has a total of 18 points in several characteristics (Dunk, 3pts, Speed, and Defence), and 8pts max for each. Every team has its own characteristic. For example, America (New York in the US Version) is good in dunks and bad in 3pts. Unlike Taiwan (Philadelphia in US version) which is good in 3pts and bad in dunks. There are 3 players for each team. If you want to get in you have to answer the call. when the whistle blows - it's a free for all !! MAGIC ON THE BLACK TOP - WORK THAT BALL! I don't really care much for sports games (especially basketball), but from looking at the YouTube videos, this looks pretty darn good. The soundtrack is actually very interesting. I am curious what this one is like in single player. I might try this one out some time via the Virtual Console. Yeah, I'm not really a fan of sports games myself, but arcade style sports tend to be more frantic and fun. As a kid I played games like Hit the Ice, NBA Jam etc and while I never owned a copy of Madden I still dig arcade style sports games now and then. The Neo is home to some classic series like Baseball Stars, Super Sidekicks, 2020 Super Baseball, Neo Turf Masters etc. Ended up playing a few rounds before work today, single player and it's actually a lot of fun. Games tend to be close and competitive, especially because you have to make sure you outscore on the first half or lose a credit. All about learning defense. I'm pretty good at stealing, but still terrible at blocking shots / dunks. It's a fun and solid bball game all around. In the genre, NBA Jam is still much better, but it's nice to have 3 on 3 instead of just 2 on 2. I'd say it's better than that Charles Barkley Shut up and Jam.. (and way better than that horseshit of a game for Jaguar, White men can't jump.. which is probably the worst Basketball game ever. I would have said Magic Johnson's Super Slam Dunk but the amazing commentary is hilarious and makes up for it. 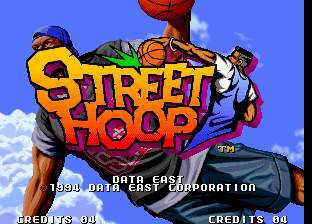 Recently I got the MVS version of Street Hoops and after all I'm more than satisfied with this game. Along with Windjammers and Neo Turf Masters this title is a top-notch Neo Sports game and highly recommended for a quick match with a buddy. As Valgalder already wrote, I only can confirm that the soundtrack is superb. Personally I don't like any kind of Hip Hop, but this kind of cheesy and catchy 90's Rap is just awesome. The lyrics from this video are just screamingly hilarious! Like most of SNK's sports games, this is one I have never played. But I might have some time to kill in the near future, so I'll give this a go. BTW, what other basket ball games does the Neo offer? 2D: I think this is the only B-Ball game ever released on Neo. On Topic: Although I really don't fare much for sport titles as well, this is somewhat enjoyable. LIFE_IN_2D wrote: BTW, what other basket ball games does the Neo offer? There's still a unreleased prototype called Dunk Star, developed by Sammy in 1991. Although it doesn't look so enjoyable, if you ask me. LIFE_IN_2D wrote:BTW, what other basket ball games does the Neo offer? Dunk Dream '95 / Data East's Hoops. Data East, after becoming cocky from winning the court case between them and Capcom for their Street Fighter rip-off, Fighters History, Data East decides to try to rip-off another extremely popular arcade game - NBA Jam. Like Fighters History, the game is a flop and mocked for being a rip-off of a much superior game and fails to innovate. Also, for a Basketball game, African Americans are actually the minority here (at least in the original version). 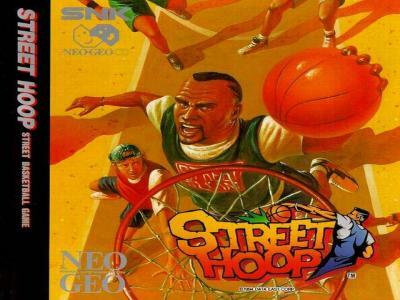 i got Street Hoops and after Merlin recommended it, and its a a good game. i love the graphics and overtop presentation. i havent really played it enough yet to comment further, but i worry it might get a bit too repetitive. Glad you've been enjoying the game RiKo. I love this game in fact it's my favourite sports game on the Neo Geo. Graphics look really nice and colourful and the music with the cheesy rap lyrics is really amusing. 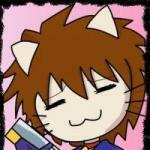 Gameplay is fast paced and exciting and the special moves look pretty cool. Very fun game with two players. 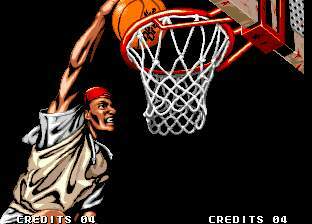 As for the comparison to NBA Jam well personally I think Dunk Dream is a lot better. Graphics, music and presentation are superior in Data East's game and I find the gameplay much more enjoyable too. I also like the fact that it's 3 vs 3. It always surprises me how many people say they don't like/play sports games. I'm not someone who watches sport on TV or ever plays any sports myself but I find games like Dunk Dream, Neo Turf Masters, Baseball Stars 2, Neo Geo Cup '98 etc. very entertaining. 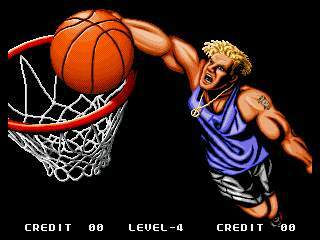 The sports game genre is actually one of the Neo Geo's strengths. Even if you think these games wouldn't appeal to you please give them a try. You might be surprised. Kerwality game. Initially I bought the CD version just for the collection's sake but when I actually sat down and played it I was pleasantly surprised. Loads of fun. I prefer it to NBA JAM by a country mile. Agreed! I'm also surprised at how many people say they "don't like sports games" but never bothered to play any of these games. You don't really have to be a big sports fan to enjoy these aracde style games. I love'em, and wish there were more of them instead of 3236 soccer games. Imagine if Tecmo made a football game back in the day - would have been legendary. Football Frenzy tries to take that approach, but Tecmo mastered the arcade football. too bad there was no Hockey games made.. not that it's a huge sport elsewhere, but would have been fun! A hockey game on the Neo Geo would have been great Valgalder I agree. I used to love playing the NHL games by EA on the Mega Drive. A Tecmo Football game would have been nice too. I've always quite enjoyed Football Frenzy myself. Not a terrible game like some people make it out to be. I'd say the only genuinely bad sports game on the system is Power Spikes 2. Sports games don't get much worse than that! I think one problem is that folk compare Neo sports games with home console games. I'll admit that they don't offer the same level of depth as some but then they weren't designed that way, they're arcade games. That's about it really. I have affinity for team based sports games whatsoever (football, rugby, Ice Hockey, PROPER Basketball games etc) - but 2 on 2 NBA JAM is fine by me! I have this game on Data East Arcade Classics. It's very frustrating. Major Title was in fact the prequel to Turf Masters soo... yeah I'd probably enjoy it -even if it is just a 'filler' title Merlin! Irem golf games like Major Title for myself one of these days. Speaking of tennis games I really love Smash Stars by Capcom. One of the best tennis games around. Interesting to note that Dunk Dream (along with some other Data East Neo Geo titles like Magical Drop 3, Fighters History Dynamite and Miracle Adventure) has been released on the Zeebo console. I wonder if any other Neo Geo games will appear on that system. Would be nice to see Ghost Lop finally getting an offical release too. It seems that in the future the Zeebo will be available in more different countries including China in 2011.